Can you think of anything stupider to fight about? Arguing about the nature of the Flying Spaghetti Monster. If you’ve been touched by his noodly appendage, this is not supposed to happen. An experience interacting with a rather un-Christian biblical apologist some time ago left me somewhat unsettled, and I wasn’t able to think about much else for a couple of days. The thing that unsettled me the most was that despite my best intentions, I felt myself being dragged into the fray. Additional research on the internet has led me to a plethora of websites of every possible permutation. You get the picture. Choose one from column A, and one from Column B, and you’ll be able to find it out there. Incredible amounts of time, effort, indignation, anger and outright hatred are being spent in attempts to prove, by logic, or reason, or scripture, or exegesis, or tradition, that which is virtually unprovable – hence the cartoon above, which I created more for my own benefit than anyone else’s. And it all comes down to the most basic of human addictions, the addiction to being right. Of course, none of this is new. It’s only that the internet era gives us fingertip access to the full spectrum of human maladjustment and brings it into clearer focus. People have been killing each other for their differences, religious and otherwise, since the dawn of time [be careful, that link is a bit grim]- and since the same epoch, there have been those who have risen up against the madness. I remember back in the late 60’s and early 70’s when Vietnam was in full swing, a popular bumper sticker read, “What if they gave a war and nobody came?”, and that led me to an odd thought. My own faith holds out that before Christ comes again, the earth has to be made ready for his coming. Part of this involves preaching the Gospel to every nation, kindred, tongue and people, which is why almost everywhere you go, you see our young missionaries out spreading the word. That’s well and good, but what’s the ultimate point of that Gospel? Imagine with me for a moment that the earth was divided into only two nations, Exegetia and Harmonia. The Republic of Exegetia consisted of three billion people. 99% of those belonged to a single faith – the “correct” one, whatever that happened to look like. Other than that, things were pretty much the same way they are now. In Harmonia, there were also three billion people, of all different persuasions, religious and secular – and it was not uncommon to find a mosque and a synagogue built next to each other, right across the street from a Hindu temple, an Anglican chapel, and a chapter of the Harmonian Humanist Society. While not everyone was rich, there were no poor, because everyone believed in a society where everyone wins. People didn’t covet one another’s goods. People didn’t lie, or steal, or rob, or murder, or slander or persecute one another. People lived simply, so that everyone could simply live. People respected their environment, and did all they could to be good stewards of the only planet they had to live on. People were kind, and loving, and charitable. Lawyers and judges were out of work, because nobody wanted to sue anyone else. This, then, is the Ecumenism that I support. It has nothing to do with the various faiths trying to become like one another. It has nothing to do with everyone joining the “First Church of Blah Unsalted Farina”. It has to do with each one of us, regardless of our walk in life, reaching out to every member of humanity and doing our best to create an entire planet where everyone wins, and helping every other member of our species to make it across the finish line. Utopia won’t come cheap. Given human nature, there will always be poor folk, there will always be those who don’t obey the rules, there will always be illness, natural disasters and everything else that makes our world a challenge to live in. But what if we were to make it even halfway to that glorious goal? Wouldn’t that be better than maintaining the status quo? The more time goes on, the more I become committed to bringing people to Christ (which is my particular walk) by raising the human condition, rather than worrying about what they wear, which scriptures they read or which direction they face to pray – or if they even pray at all. I may be the only book of scripture that some people ever read. Just saying that could get me heaved out of my own faith by certain people. This image recently popped up on my Facebook feed, and I found it disturbing. I’ve seen that before elsewhere; there’s a fallacy in there, one which many atheists seem to miss. I am reminded of a young Corrie Ten Boom, who asked her father what “sexsin” was. The father kindly asked her to carry his suitcase; upon trying, she found it far too heavy. He explained to her that like suitcases, some knowledge was too heavy for a child to carry, and asked her to trust him with it until she was older. She was satisfied. Now this particular quote was directed at a degraded evangelical turd who put out there that raped children are “evil” and hence deserving of whatever they get; it’s easy to understand why in the heat of outrage over such an ignorant premise that someone might say something of that nature. But the quote annoyed me because it sets up the same false dichotomy – that God is somehow equal to humans and subject to the same rules and logic as humans are. The picture itself is a perfect example of this compulsion by the atheist community to belittle people of faith at every turn. Showing the amazing and impressive ability of technology to improve the lives of people and raise the human conditon is a wonderful thing. Turning around and attaching a cheap shot at people of faith detracts from the message. The same argument can be applied to people of faith, and most particularly evangelical Christians who condemn every unbeliever and agnostic (as well as the rest of the believing community who don’t happen to believe in exactly their version of whatever) to an eternal Hell, as though they had the authority to do so. Oh & that’s why science has cured cancer right? I (along with a few other friends) prayed over someone who had pollups (sic) & the next week (without any medication) his pollups were gone.. I don’t see science doing that. 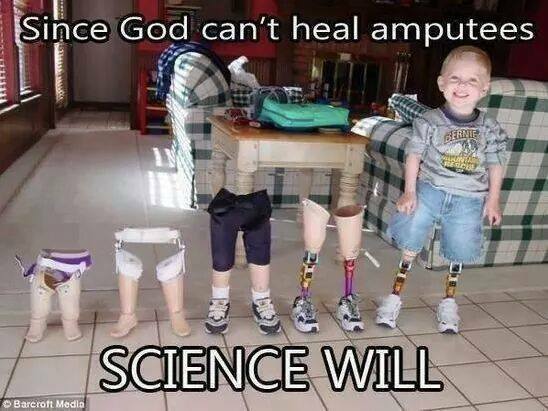 The only reason some science works is because God wills it to. Science can’t heal a broken heart, nor can it comfort those who need comfort or save your soul or give you eternal life. When you die, you call out to science… & see where you end up. Until then I’ll be praying for all of you who are unsaved. This quote is filled with so much wrong that I don’t know where to begin, so I’ll just let it speak for itself. Now, the picture above was posted by an intelligent and respected friend. He, and everyone else, is free in this world to believe in something metaphysical or not.1 But in the name of whatever you consider holy, be it some deity or the amazing power and creativity and goodness that can be found in humanity, stop taking pot shots at each other. It helps nothing, it convinces nobody, and it just ends up polluting the social environment and making everyone who does so look petty and vindictive. Mohandas Gandhi is reputed to have said, “Be the change that you wish to see in the world.” This is good advice, regardless of which side of the theological issue you happen to fall on. 1 Oh, wait, I’m forgetting about people who flog and decapitate unbelievers. Well, in most places in the civilized world, then. 2 I hate theological/political/scientific debates. As a result, I have disabled comments for this post. If you have a position to espouse, post it in your own blog. If it has merit, if it lifts me and inspires me to do better and help others and raise the human condition even more, I’ll consider it.